It’s no secret, I love photography and dogs. A recent assignment sent me to Cocoa Beach, where I spent three fun-filled days covering International Dog Surfing. Nothing could be better for me than meeting and capturing canines (of every shape and size) on a beautiful beach with glorious Florida weather with fellow dog lovers. 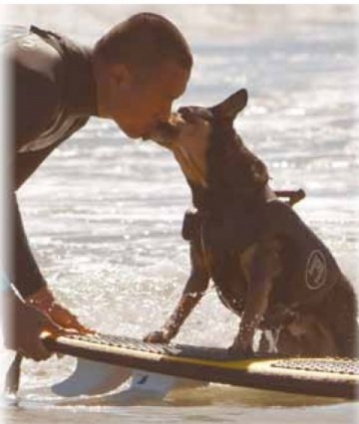 You may wonder, do dogs really enjoy surfing, or is it something their owners just want them to do? The majority of surf-pups were snuggled in life vests and gleefully raced to the water’s edge. They took to their boards, with gusto. The most tasty waves were selected and dogs were launched on a surfin’ safari. Most dogs knew what they were doing. They balanced themselves while gauging the surf and wind. Many rode right into the shore, while others endured comical wipe-outs. After reaching the safety of the solid ground, a couple dogs ran toward the dunes, as if to say, “All right, I made it. I’m done” (only to be pulled and put back in the soup). If you insist on doing something that your dog clearly doesn’t enjoy (or feel safe doing), the bond you have (or wish you had) is going to be broken, and eventually irreparably damaged. The East was pitted against the West with the arrival of California residents: Abbie, Jedi and Faith. Their pet parents share the same philosophy: Find something you and your dog enjoy doing together and make trust the foundation of your relationship. These west coast dogs are noticeably bonded to their owners, especially Australian kelpie Abbie and her dad, Mike Uy. “Sports are a great way to build a bond, since dogs are naturally athletic. Surfing doesn’t come naturally for a dog. Abbie loves the beach and showed interest and curiosity for surfing. We also bike and paraglide together. Abbie looks to me for safety, as much as having a good time”, stated Mike. “Let me add, maintaining trust is even more important than building it.” He’s often asked which treats he uses for training. “Having fun together is OUR treat”. Cowabunga!